Not much to report since our July 4th post. Elaine is counting down until her official retirement on 9/30/2011...tomorrow it will be 6 weeks +, or 47 days to be exact! Monday through Friday we wear our workaday hats, and clean a few cabins on the side. On the weekends we have been doing a lot of bicycle riding. 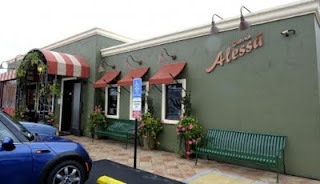 Three weekends ago we rode our single bikes from Angel Stadium in Anaheim down the SART (Santa Ana River Trail) to Newport Beach where we had brunch at Cucina Alessa, which is right on Pacific Coast Hwy just south of where the Santa Ana River Trail terminates at the ocean. The total round trip mileage was 26. Two weekends ago we did a shorter 10 mile ride to a local Starbucks for breakfast. 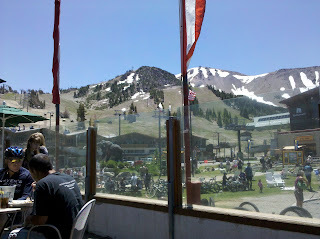 One weekend ago I spent 2 days at Mammoth Mtn. riding in their mountain bike park doing about 54 miles of downhill riding over two days. This weekend Elaine and I got out our recumbent tadpole trikes and headed up to the Pacific Electric Rails to Trails bike path in Rancho Cucamonga. Normally we start our ride at the eastern most trailhead in Rancho Cucamonga on East Ave. just above Baseline (a few hundred feet west of Interstate 15). When this rails to trails bike path is finished it will run from Rialto, CA all the way to Claremont Colleges in Claremont. This path follows the right of way for the old Pacific Electric railway, which, in its day, was one of the best mass transit systems in the Western U.S. There were literally hundreds of miles of track running all over Southern California on which the Electric Red Trolley Cars carried citizens at very little cost. When this amazingly efficient mass transit system was replaced by buses the right of way sat dormant for decades, and was, frankly, an eyesore. Now the cities of Claremont, Upland Rancho Cucamonga, and Fontana have joined together to repurpose this right of way providing a wonderful local resource for recreation for thousands. Our intent this day (Saturday, 8/13/2011) was to ride west to Vineyard where the trail temporarily ends as "they" construct a new bridge over Foothill Blvd. We did not realize that in the past few months Fontana and Rancho Cucamonga had connected their two sections under the I-15 freeway making the trail virtually complete now....just awaiting the one small section on the one short stretch over Foothill connecting the Rancho Cucamonga and Upland sections. As we were riding westbound an older gentleman (like we're not older, too....haha!) 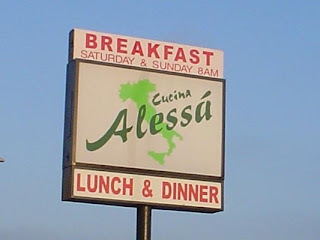 pulled up along side us as we pedaled and informed us that the Fontana section was now connected! After making our turn at the Vineyard closure we decided we would head all the way back into Fontana and see how far the trail went. The ride we had planned was about 13 miles round trip, but with the addition of the Fontana section we ended up riding 27 miles total. 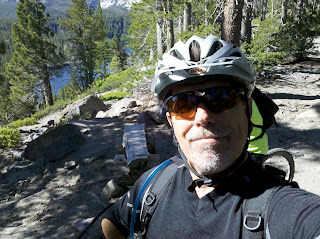 Below is a video of our ride. The weather has been very moderate the past 5 weeks....maybe one day over 100, but mostly high 80's, low 90's with a lot of heavy overcast many mornings, aka: marine layer. The campground has been 90% full each weekend. So, that't it from Rancho Jurupa Regional Park for now. Thanks for reading!